« The Art of the Envelope Tease. Creating effective envelopes doesn’t necessarily mean spending a lot of money. To the contrary, it means understanding your audience and offer and then creating an appropriate fit. Here are recommendations to ensure that recipients welcome your client’s next envelope package. Put the company name on the envelope if you’re confident it will cause a positive reaction from recipients—otherwise leave it off. Ensure the envelope is at least ¼” larger than the inserts. Match images, graphics and copy appropriately to the audience. Use metered mail as a second choice, but avoid the dreaded indicia— studies show that Fortune 500 companies route 30% of Standard Mail to the wastebasket immediately. Personalize—that can mean anything from variable data messaging to using a legible script font or actual handwriting—tell this to non-profits twice, if necessary. Play the angles—an angled teaser line or even a slightly angled stamp can make an envelope get noticed. Put the offer on the envelope—especially to a cold list. Address your b-to-b mail to generic titles if at all possible—nothing screams mass mail louder than generics. Dupe recipients into thinking the envelope contains something it doesn’t—tone needs to fit the actual contents. Forget to recommend ordering 5-10% more envelopes than they need—clients can forget they’ll likely suffer some damage in setup. Time the mailing to arrive on Monday, the heaviest mail day of the week—aim for Tuesday, the lightest day, or Wednesday, the second lightest. 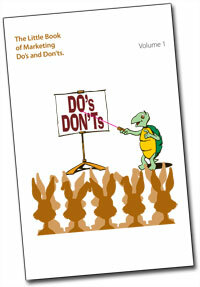 Simply email Larry Bauer your postal mailing information and we’ll send you a complementary copy.